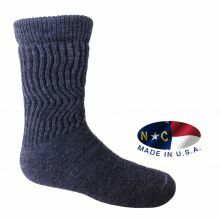 We have added a number of new styles to our selection of American made alpaca socks. In addition to our popular therapeutic alpaca socks, which are available in seven colors and two sizes, we now have a wonderful alpaca sport sock with a mesh fabric and a ribbed arch support available in four sizes. We also have added 5 new styles of ladies’ dress socks. They are designed and manufactured in North Carolina. Each are available in multiple colors with unique jacquard patterns. They are as soft and comfy as they are stylish. One of our favorite new socks are the Cozy Feet alpaca socks. They are soft and fuzzy on the inside and have non-slip grippers on the bottom in the shape of running alpacas. All of these Made in the U.S.A. alpaca socks use an approximately 50% alpaca yarn blend. Alpaca is a soft natural fiber known for its ability to keep you warm without overheating, stay dry by wicking away moisture, and its anti fungal properties. Alpaca socks make wonderful gifts and special treats for your feet. 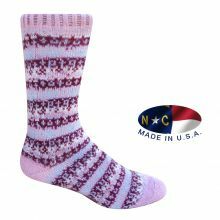 You can see our complete selection of alpaca socks that are made in America in our farm shop or online. We also carry a great selection of alpaca socks made in Peru, including our popular alpaca boot socks with our farm name on the bottom.